By their very design, Roatan’s boutique resorts provide an intimate feel and personalized service that have visitors returning time and time again. Tucked into the lush hillside looking down on stretches of secluded beach or perched atop a rocky bluff, boutique resorts offer tranquility and serenity many seek out in a Roatan holiday. And don’t let the small size fool you: there’s plenty of gourmet food and live entertainment along with onsite scuba diving operations, making sure you needn’t leave the resort if you don’t want to. 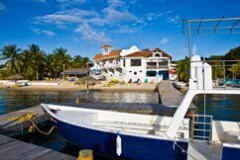 With a Roatan boutique resort, you are that much closer to an unforgettable Caribbean holiday.